One man’s efforts to save a local landmark resulted in the restoration of one of Pitt County’s most historic structures. In 1790, a house — four over four, in the style of the day, with 12-foot ceilings and pine floors — was built outside Greenville, in Pitt County. Years passed. Wings were added in the 1840s. Slaves worked the cotton and tobacco fields. Both town and plantation came to be named Grimesland for Bryan Grimes, a Confederate general who lived there before his murder in 1880. More years passed, a century’s worth. The 200-year-old floors rotted. AC units sagged from the windows. By the 1990s, the splendid, storied house had fallen into disuse and disrepair. 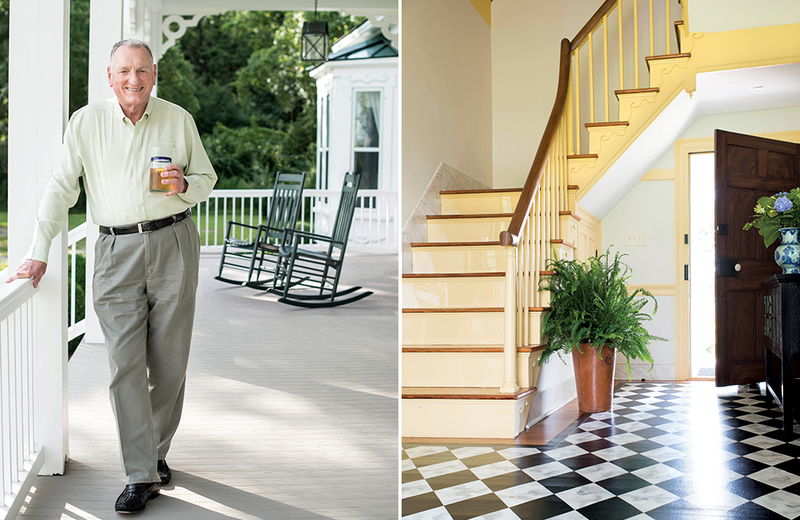 Enter Eddie Smith, a man who refused to watch a historic homesite die. Smith purchased Grimesland in 2008 and began the arduous process of down-to-the-studs renovation. (The firm that lifted the Cape Hatteras Lighthouse raised Grimesland’s foundation.) 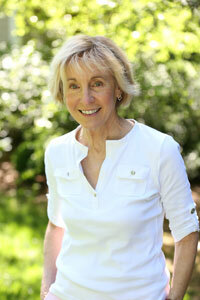 Smith worked hand in hand with Preservation North Carolina, an organization that understands historical accuracy as well as practical livability. 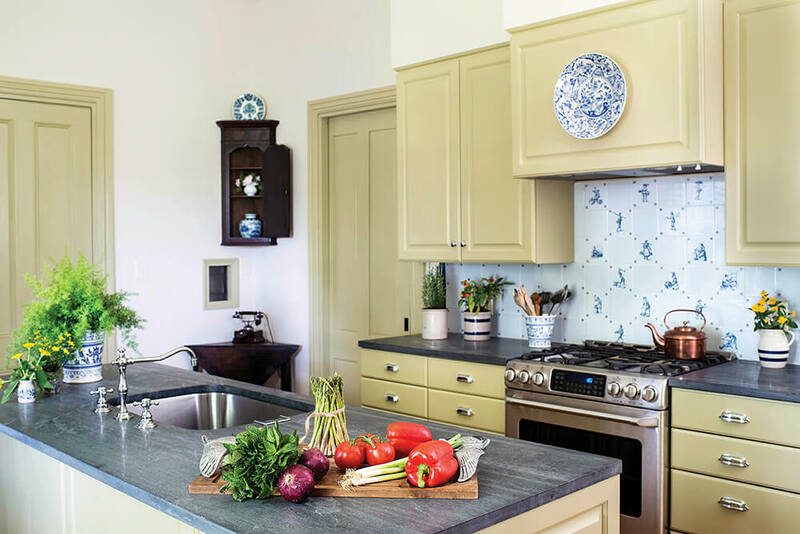 Hence the soapstone counters in the kitchen, and a dining room whose wall shade is possibly a wee bit brighter than the blue — and gold — paint colors original to the era. Smith’s wife, Jo Allison, is, like Grimes, a devotee of the University of North Carolina. When the Civil War ended, and state universities were bankrupt, Grimes contributed some of his own funds to keep UNC open. Today, Grimes dormitory is named for his son, John Bryan Grimes. 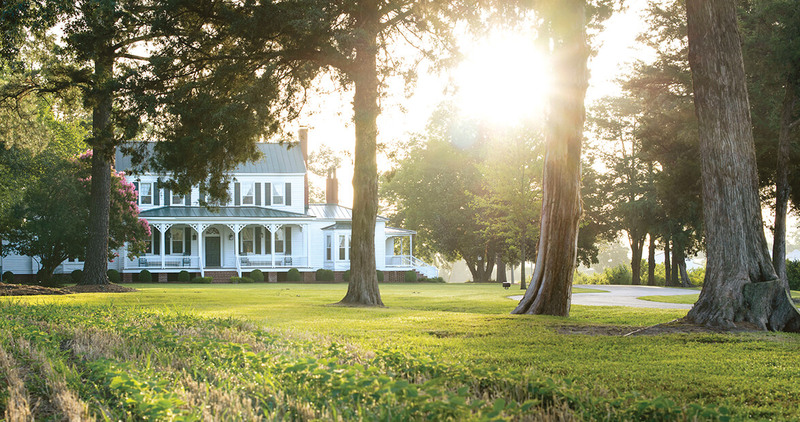 Stats and facts, then, both historical and current: Grimesland is the oldest property in Pitt County, and it’s one of the biggest contiguous blocks of land in the county, comprising an unusually large 3,300 acres, of which 800 are still farmed. The home was constructed entirely at an off-site sawmill. Plaques attached to boards explained the order in which they should be rebuilt after the materials arrived at the property via water and rail; a railroad track still runs nearby. An intentional north-south setting with symmetrical front and rear doors allowed breezes to be pulled inside and up the narrow staircase into the upstairs. The most important fact of all, however, is that Grimesland stands today as it did then, right down to the cistern, barn, and dairy house, right down to the paintings, furniture, and fireplaces: a proud, airy, upstanding lady, surrounded by sunflowers. All because a fellow had a notion that preservation for preservation’s sake was worth it. 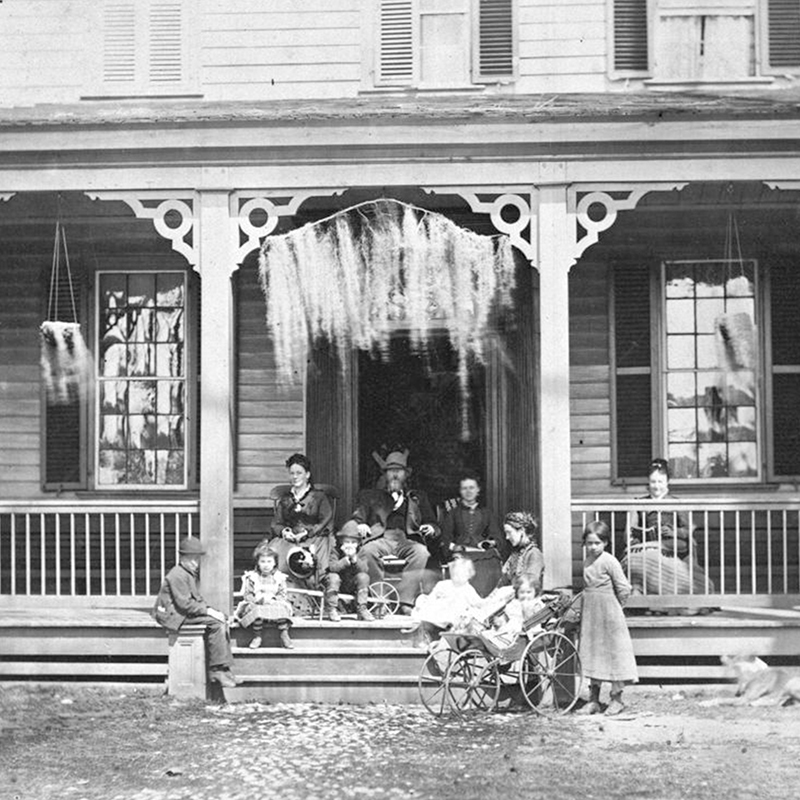 The parlor was the most formal room in the home. Now, as then, it’s decorated with contemporary and antique furnishings, the latter of which are original to the period. However, the original portrait of Maj. Gen. Bryan Grimes, the last officer appointed to major general in the Army of Northern Virginia during the Civil War, now hangs at the University of North Carolina at Chapel Hill. Portraitists often employed a stock torso, painting only their subject’s head. 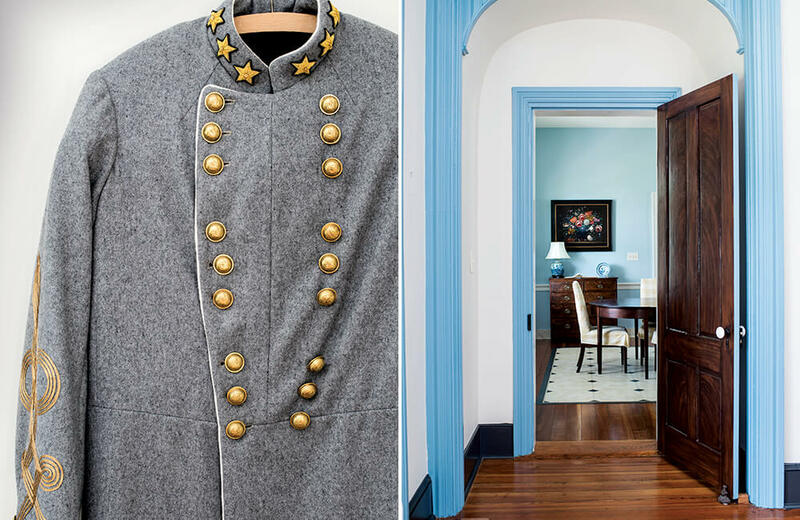 In person, however, uniform decorations like these indicated which Civil War general was whom. The solid doors, like this one leading into the dining room, were painted to look like mahogany, even if they actually were mahogany. Being acquainted with a talented faux painter signified wealth and class. During renovations — “down to the guts,” says Cameron Boltes, the property manager — an original iron shutter dog, which kept shutters flush against the house’s exterior, was discovered, and replicated for every other shutter. In the modernized kitchen, a glimpse of this original hardware is framed behind glass beneath the hanging corner cupboard, precisely where it was found. The 200-year-old pine floors in the dining room are covered with painted canvas, just as they would have been in the 1800s. Note the wooden case in the corner, meant for transporting liquors and spirits. In the schoolroom, or card room, Grimes’s wife taught slaves to read and write, even though doing so was illegal. 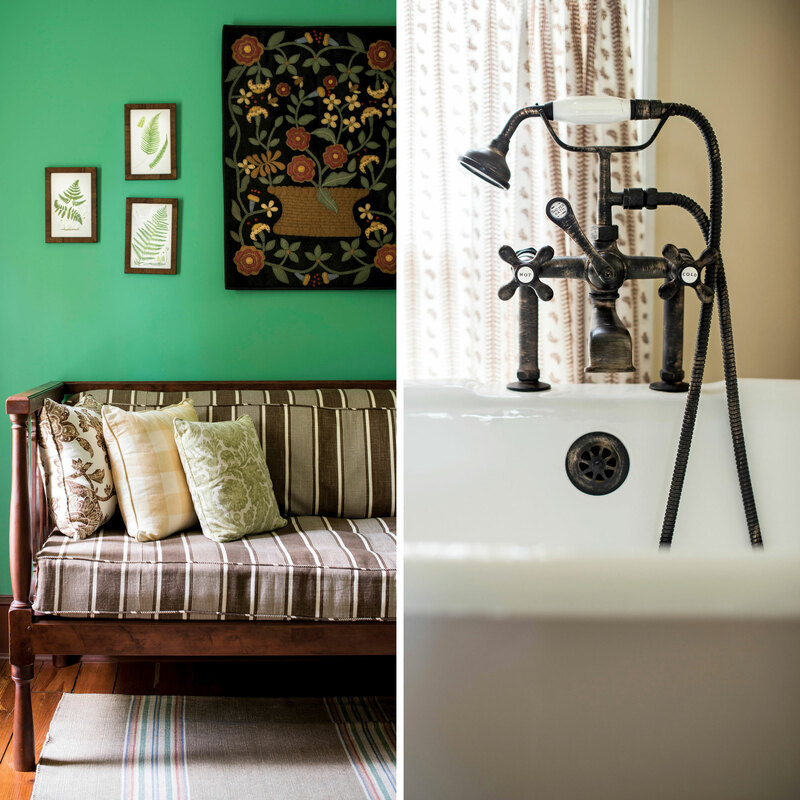 Upstairs, bathrooms are updated but keep with a period look. 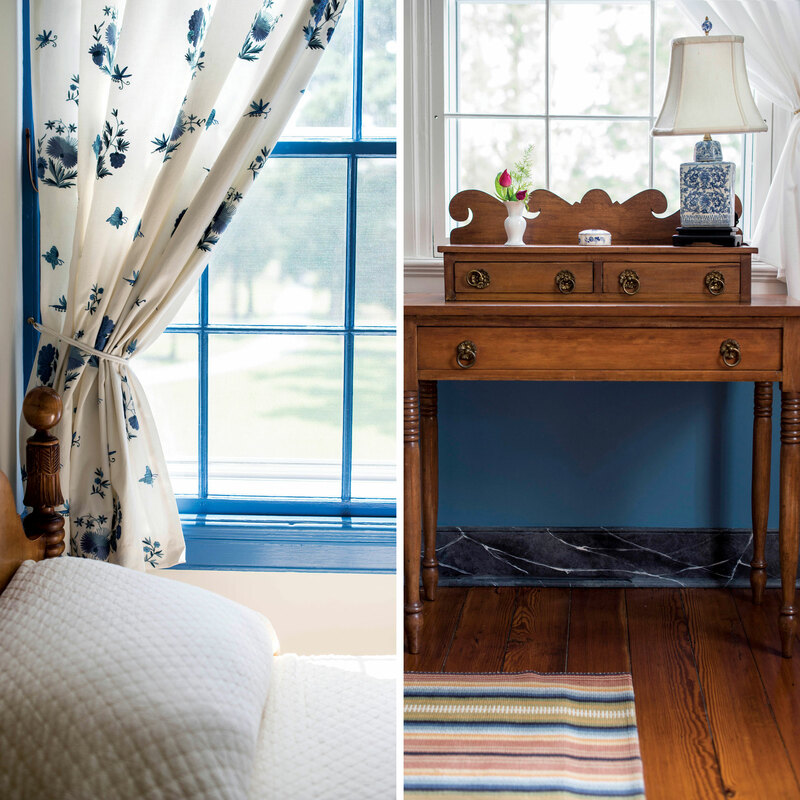 Bedrooms await visitors who attend Eddie Smith’s classic plantation hunts for deer, turkey, duck, and quail. 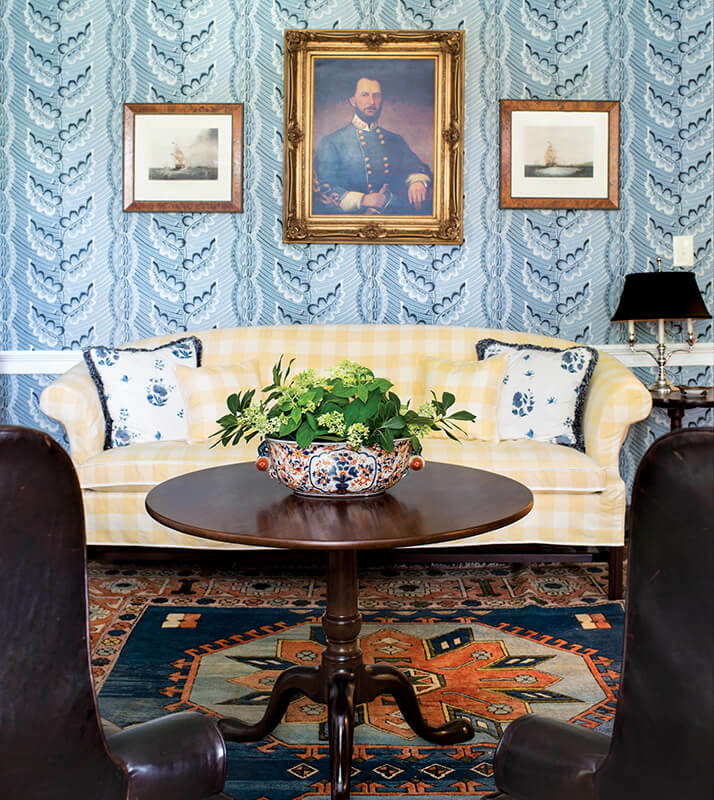 On the main level, accurate simplicity awaits 21st-century visitors in a bedroom that features a quilt, a hooked rug, and a single-panel gingham curtain. And every room boasts a fireplace. At one point, 100 slaves worked on Grimesland. 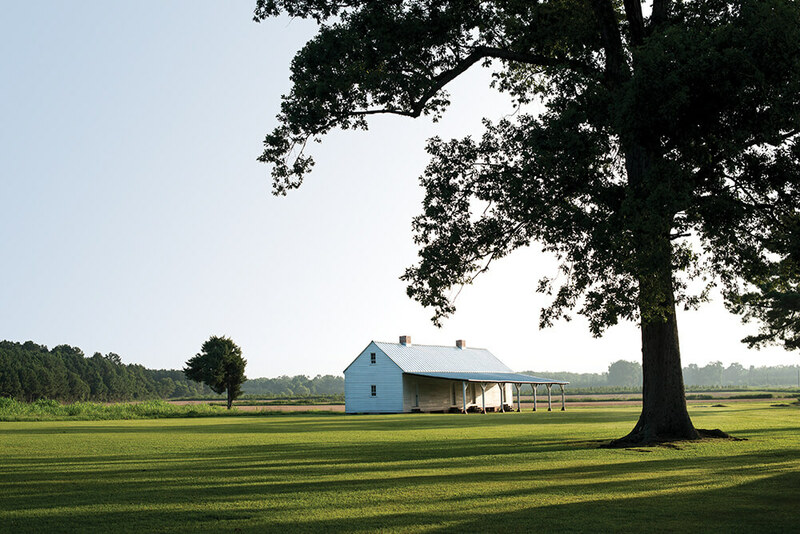 Four to six slave quarters, like this one, once stood on the property. Each housed about 20 slaves. Generations later, a lush lawn blankets forgotten footsteps. 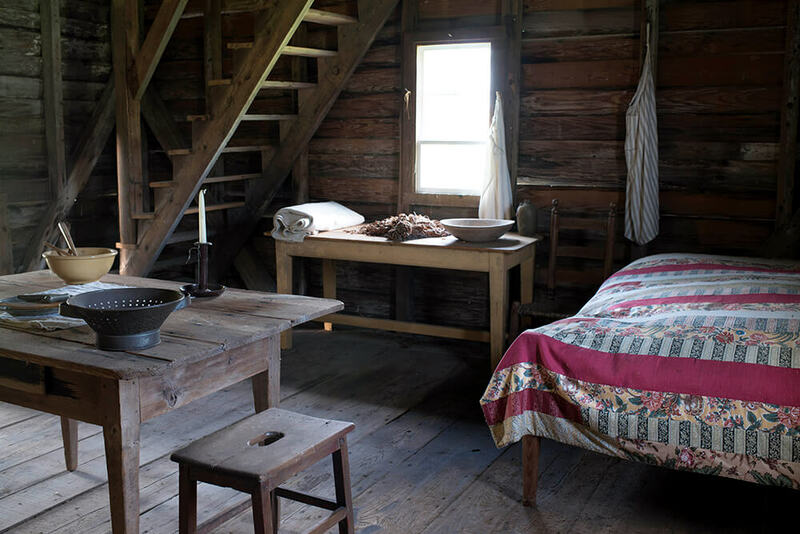 The interior of a slave family’s cottage has been faithfully replicated. A firm was hired to find the simple furniture, clothing, and other belongings original to the time. A stand of old trees flanks the entrance — and the open gate — to Grimesland. 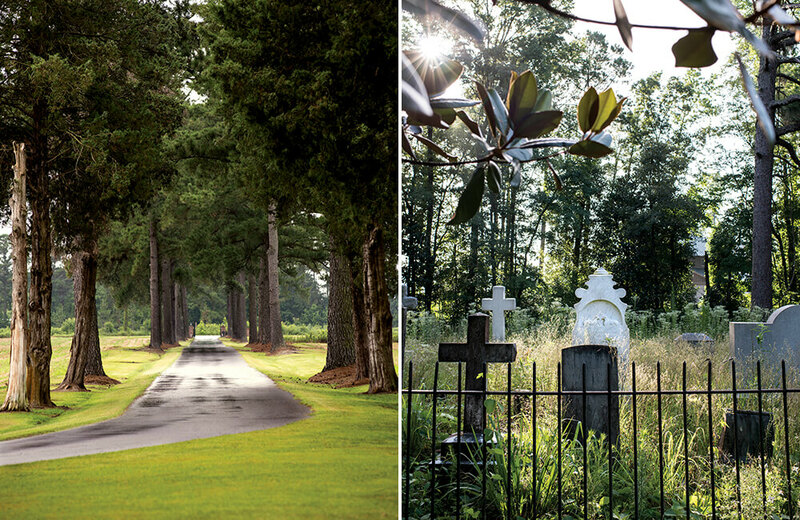 In a clearing some distance from the house, Maj. Gen. Bryan Grimes is buried in the small family graveyard that’s separated from pastureland by little more than trees and an ancient wrought-iron fence. In Grimes’s time, barn sizes depended on two things: how much livestock feed you needed to store, and how cold your winters were, which dictated whether you needed to be able to house all livestock inside. Built in the early 1900s, this barn would have held 100 mules. 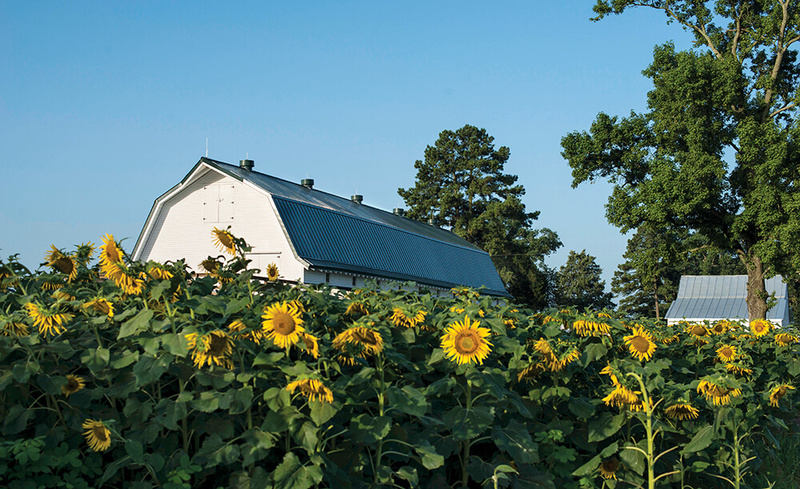 Today, it provides a splendid backdrop for a palette of golden, nodding sunflowers.